Cost: Lymington : £650 with a deposit of £250. London (Ealing) : £900 with a deposit of £300. Please note: Your place will only be confirmed once the deposit has been received. In order to enrol on a Basic level course in the Original Dr. Vodder Method you need to provide evidence of pre-existing levels of relevant training and experience as detailed below. Anything less is considered to be insufficient in preparing the prospective student for the rigours of Dr. Vodder's MLD training and subsequent clinical practise. Those people with a medical background such as doctor, nurse, chiropractor, osteopath or physiotherapist are acceptable. Countries with a state registered massage therapist occupation (requiring a minimum of 2,200 hours of training) are included in this category. Evidence of your qualification and/or medical registration number needs to be submitted with your completed application. Photocopies/scans are acceptable. People with other massage therapist training and qualifications need a minimum of 344 hours training and exam success. The practical (hands-on) element must have been in the classroom or supervised for a minimum of 250 hours. If home study and/or case histories formed part of the course these must have been documented and submitted for assessment by the course provider. The exams must have been taken in person and passed. The theory elements (anatomy, physiology and pathology) must be for a minimum duration of 94 hours and may be in the classroom or home study (including on-line). The exams must have been taken in person (and if on-line, at a supervised examination centre) and passed. Proof of your qualifications and/or medical registration number need to be submitted with your completed application form. Photocopies or scans are acceptable. If you no longer have the details, your course provider/s may be able to supply you with a copy or a letter of confirmation. MLD Training is unable to carry out enquiries or research on your behalf. If you are not sure whether your existing qualifications meet the requirements then please contact the office on 01590 676 988 for clarification. Enough practical skills to start learning how to do MLD in a variety of situations. Each of the five days is divided into theoretical lectures, practical demonstrations and students do practical work on each other to hone their skills. 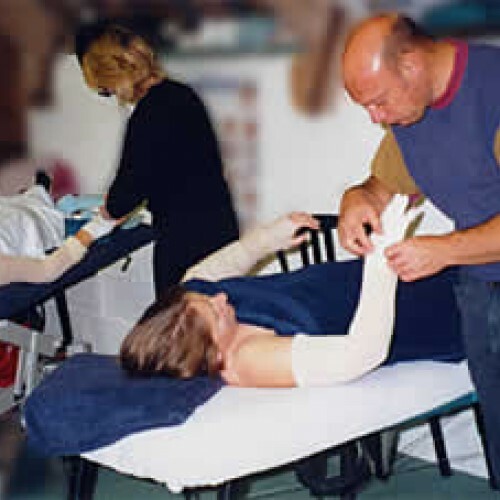 The course is the first stage of MLD training, as there is no exam so at the end of the course you are only entitled to practice on friends or family members with a healthy lymphatic system. You will also have to sign a declaration that you will not otherwise treat anybody else or to teach MLD. In order to progress to working on the general public - with healthy lymphatic systems - you will need to complete a Therapy 1 course and to pass the associated exams. There is no case study work involved. When the course is completed, each student is issued with a certificate of attendance. The certificate gains the student entry to any Dr. Vodder School Therapy 1 course held in the UK and worldwide.